Steam Specials In The Heartland - three exciting chapters featuring four steam locomotives operating on special excursions. Union Pacific 3985 & The Missouri River Eagle - in September and October, 2010, UP brought out the largest operating steam locomotive in the world, Challenger 3985, to pull a train called The Missouri River Eagle. Our story of this one-time special starts in North Platte, Nebraska, the home of UP’s giant Bailey Yard. We present the special as it makes its way across the Heartland as far east as St. Louis, Missouri, with major stops in Marysville, KS, Kansas City, MO, Jefferson City, MO, and Sedalia, MO before returning to North Platte. We had no idea at the time that this would be the final trip for 3985 for the foreseeable future! You will enjoy incredible trackside action as the mighty 4-6-6-4 roars across three states. See close up views as the locomotive moves slowly past our cameras, the engine being serviced, and some of the great sights along the way. Milwaukee Road 261 To Duluth - after its first restoration to operating condition, we enjoyed accompanying 261 during its 15-year string of excursions starting in 1993. Most of those years it pulled a two-day Spring Special from the Twin Cities to Duluth, MN. In this feature we present highlights from a number of those trips and arrange them to illustrate what a weekend ride with the 4-8-4 Northern was like. We even show scenes from a rare trip 261 made on the North Shore Scenic line. Long-time 261 fans will enjoy watching passenger equipment changing from year to year. Our program consists of both HD and analog clips showing 261 in all its glory! 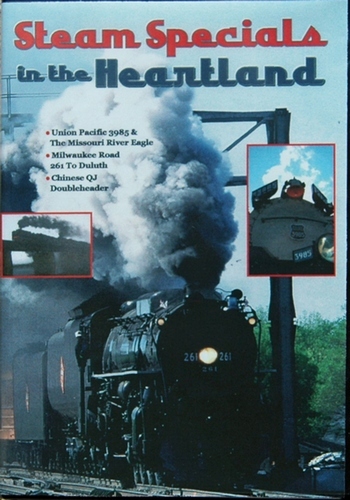 Chinese QJ Doubleheader - Railroad Development Corporation, parent company of Iowa Interstate Railroad (IAIS), owns two QJ 2-10-2 locomotives. This class was the final Chinese steam design to go into production, with over 4700 built, ending in 1988. Since arriving in the US, the two locomotives have been used just a few times. In October 2008, IAIS ran steam specials in eastern Iowa to raise money for the Salvation Army, specifically to aid Iowa communities hard hit by severe flooding earlier that year. First, our cameras follow the double-headed freight train from Iowa City to the Quad Cities. This train established a new record for steam-hauled revenue tonnage for the 21st century, carrying 66 freight cars! At Rock Island, the locomotives were separated, one to pull passenger trips east to Silvis, Illinois, and the other for trips west to Walcott, Iowa. The following day another double header brought the passenger equipment west to Iowa City. These two locomotives put on quite a show! You will love seeing them together pulling both freight and passenger trains, and apart as they move about in Rock Island Yard.